NASA’s Wide—field Infrared Survey Explorer (WISE) mission has discovered a long—hidden companion of the Earth — the first Trojan asteroid circling the sun in the Earth’s orbit. Trojans are asteroids that share an orbit with a planet, locked in stable orbits by a gravitational balancing act between a planet and the Sun. Neptune, Mars and Jupiter are known to have Trojans. Two of Saturn’s moons share orbits with Trojans. Scientists had predicted Earth should also have Trojans, but they have been difficult to find because they are relatively small and appear near the sun from Earth’s point of view. “These asteroids dwell mostly in the daylight, making them very hard to see,” said lead author Martin Connors of Athabasca University in Canada. “But we finally found one, because the object has an unusual orbit that takes it farther away from the sun than what is typical for Trojans. WISE was a game—changer, giving us a point of view difficult to have at Earth’s surface,” he added. Connors and his team began their search for an Earth Trojan using data from NEOWISE, an addition to the WISE mission that focused in part on near—Earth objects, or NEOs, such as asteroids and comets. The NEOWISE project observed more than 155,000 asteroids in the main belt between Mars and Jupiter, and more than 500 NEOs, discovering 132 that were previously unknown. The team identified a small asteroid named ‘2010 TK7’ as an Earth Trojan after follow—up observations with the Canada—France—Hawaii Telescope on Mauna Kea in Hawaii. The asteroid is roughly 1,000 feet (300 meters) in diameter. 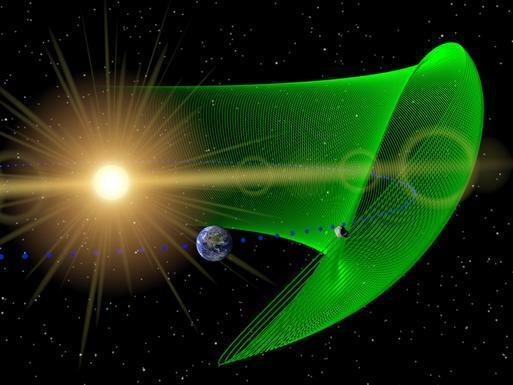 It has an unusual orbit that traces a complex motion near a stable point in the plane of Earth’s orbit, although the asteroid also moves above and below the plane. The object is about 50 million miles (80 million kilometers) from Earth. The asteroid’s orbit is well—defined and for at least the next 100 years, it will not come closer to Earth than 15 million miles (24 million kilometers). “It’s as though Earth is playing follow the leader. Earth always is chasing this asteroid around,” said Amy Mainzer, the principal investigator of NEOWISE at NASA’s Jet Propulsion Laboratory (JPL) in Pasadena, Calif. The discovery is published in the July 28 issue of the journal Nature.